Calling all peeps, car crews, and our friends in the Chicagoland area! (Wisconsin and neighboring states too!) This show is for you! What, another carshow you say?! Yes but this will be different! Have your attention now? Good! We would want to differentiate the &#9400;&#9415;&#9402;&#9420;&#9416; carshow from all the rest of the carshows out there by making it about the people more than just the cars. We have several new things to the import crowd that we would like to introduce to you all, several new things that would hopefully be enough to win you guys over! We want you to be a part of the very first peer judged carshow! Thats right, Its a carshow judged by the very same people that are in the carshow. Each crew will have the chance to judge the rest of the other cars in the carshow (except for theirs of course) for points towards their own crew's cars so the more cars they judge the more bonus points they have to add to their individual cars scores that have been judged by the other car crews! Of course we will have our own judges and folks that will be tallying up everybody's scores. Judging each others cars allows people from different car crews to meet other car aficionados who have the same passion as they do in fixing up cars. Want a photoshoot for your car? Well we will have one on site! We will have 2-3 different scenes that you see in those big magazine (online or offline) shoots ready for your car! We even have rolling shots available for folks who want to have those gorgeous shots of their cars in motion! Photogs? Yep we got you covered, we will have several photographers/videographers that are contributors to BMW performance, Honda Tuning, Canibeat, JDM Chicago, Modified, Import Tuner, etc. Need I say more? These guys will be shooting your cars in the same way they have shot the cars that ended up in the magazines and/or online publications. Just like in really good movie theaters you can reserve your place when you register for the show. We will have the lot mapped out this way these spots are going to be blocked off for you on the day of the show. No hassles the day of just show your credentials and be ushered to your spot! Remember the primo spots are going to go quick so pre-register now! We chose this lot since its big and it is easy to get to in a centralized location as well as friendly to the underside of your cars. And it helps that the Menards ppl are nice. Lot capacity is going to be around 300+ cars and when we are full we are full. So come to one of the last events of the season before your beast hibernates for winter! We will have raffles through out the day for prizes that will be from our sponsors below. Looking for an EQ bag? we will be giving away several, How about some custom powdercoating for next season? We have Source taking care of that for you! Custom stickers and wraps for your car? RTSTK is there! And more from our sponsors as we get closer to the car show so stay tuned! (we will update the show notes with prizes) Now how do you enter? Simple if you enter in the car show you will get raffle tickets and will be eligible for the prizes! Its really that simple, so we try to make it worth your money! What if you dont have a car to register? Dont worry we will have raffle tix available for purchase at the show as well! TBD soon! And yes they will have trophies and prizes! - How many spots will there be? We have roughly around 200+ spots allocated for the show. And another 200+ for parking so if you want to show pre-register quick. - Will there be food/drinks available? Yes, we have several security guards and on duty and off duty police officers present. - What if I decide to be a douchebag and do a burn out, etc? We will have trash cans around Menards parking lot, please use them! Also it doesn't matter if it is your trash or not, if you see trash please pick it up and throw it away. We would love to have all the crews participate but we know how it is, everybody is lazy! JK Please contact us [email protected] for more info and to show that we appreciate volunteers we would be giving them something extra for them and for their crews! 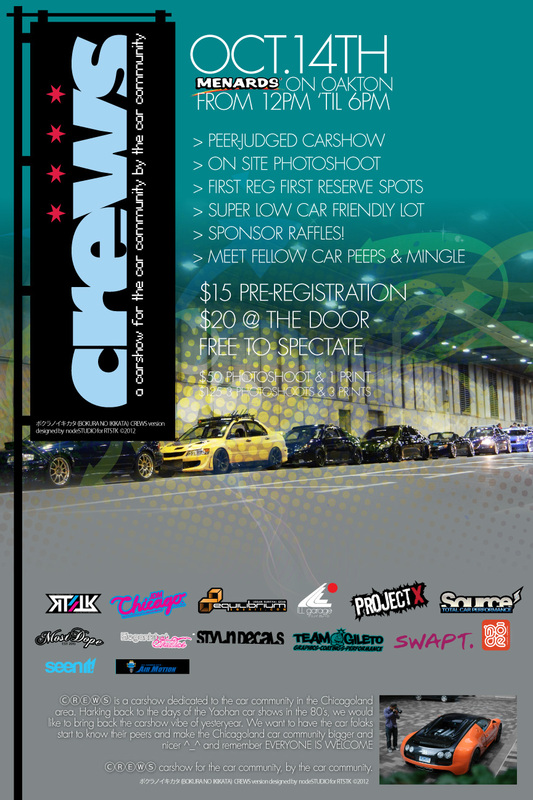 &#9400;&#9415;&#9402;&#9420;&#9416; is a carshow dedicated to the car community in the Chicagoland area. Harking back to the days of the Yaohan car shows in the 80's, we would like to bring back the carshow vibe of yesteryear. We want to have the car folks start to know their peers and make the Chicagoland car community bigger and nicer ^_^ and remember EVERYONE IS WELCOME! &#9400;&#9415;&#9402;&#9420;&#9416; carshow for the car community, by the car community. *** We will be updating the copy with additional information so stay tuned to this page! And send your company's logo is that good enough to print Thanks everybody and have a happy pre reg! [B]&#9658; Photoshoot $50 for one scene w/ print or $125 for 3 scenes w/ 3 prints [/B](more print prices and sizes to come, first come first served spaces are limited so book now!) <---paypal coming soon, hold tight! And send your company's logo is that good enough to print. I might as well go being it is so close and I'll see if I can piss off any more lady cops. Generated in 0.105 seconds in which 0.023 seconds were spent on a total of 14 queries. Turbo powered.